If you have come across this post at a similar time in your photography career, I hope a stream of new ideas and images will pump up your love for photography, inspiration and enthusiasm. Let me offer you a few fun lighting ideas in a series of posts, and I will start with one of my most favorite lighting accessories - color gels. I will also mention how to make each lighting technique execution rather affordable without compromising the quality of the outcome. 1. 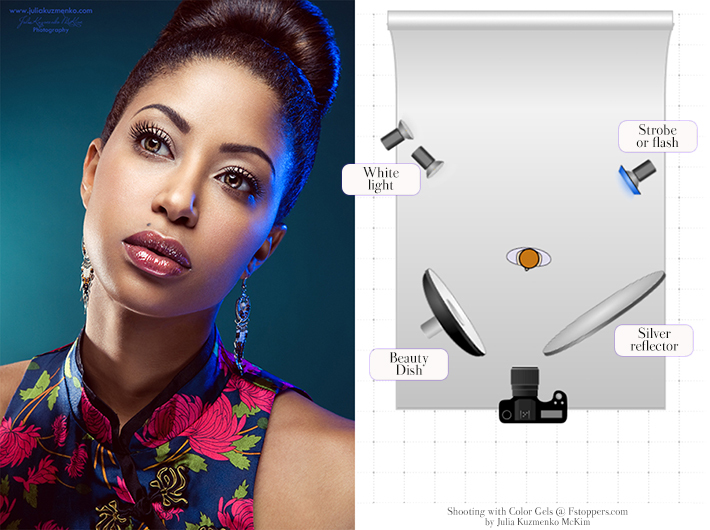 The strobes and flashes that you already have. Continuous lighting equipment will also work, but you have to be careful and make sure the higher temperature of the lamp doesn't melt the gels, which in turn will damage the light bulb. 2. You can buy proper photography color gels or filters - they start from as low as $6.99 for a set of four 12-inch color gels online. But I personally use colored cellophane rolls or wrapping paper from hobby and craft stores. I actually only had to purchase them once a long time ago, and I haven't gone through 1/3 of any of my four rolls (yellow, green, red and purple). Each roll cost me under $5 and I use them in almost every studio photo shoot. So, not only they are really cheap, they also last for years. 3. Barn door / Gel frame assembly or a roll of duct tape. 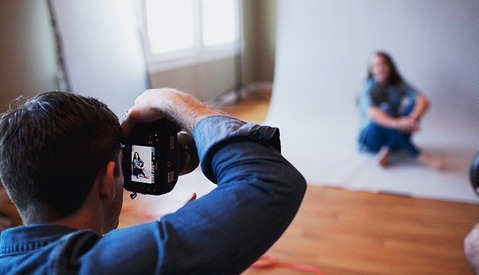 Obviously, if your studio is full of expensive lighting equipment and cool photography "toys", and that's how you and your clients like it, you might choose to go for proper color gels and gel frame assembly from your lighting equipment manufacturer. I personally carry my colorful rolls and duct tape to all my commercial and personal shoots, and my clients and fellow creatives don't care how I do the "color magic" as long as I get them the pretty pictures they are after. If you end up deciding to use colored cellophane and duct tape, keep in mind, that the cellophane will melt if it's placed too close to the modeling lamp as the lamp heats up during the shoot. The cellophane will be ruined and it may also damage the lamp if you're not careful. I always turn off modeling lamps after the lights' power and positions are adjusted for the shoot, so I don't have to worry about it. And here comes the fun part! 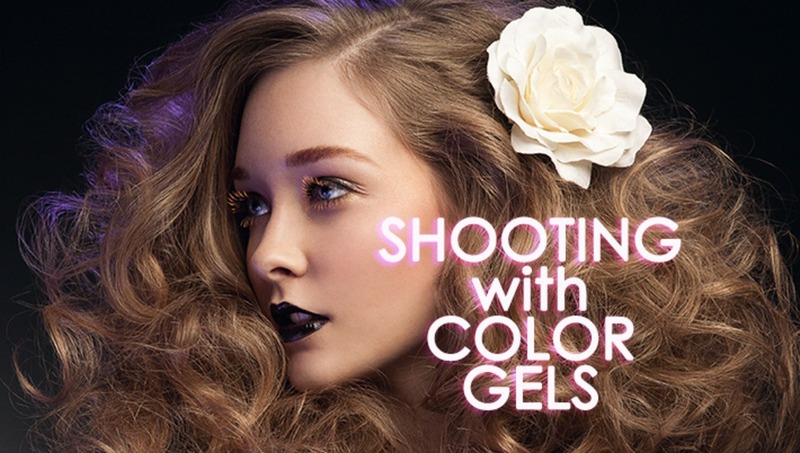 There are so many ways you can utilize your color gels, it's not even funny. There are a couple of main ways of how I use color gels in my lighting setups: coloring rim lights and coloring the main light, and tons of variations of each. Let me show you what I have created with them and how I achieved those color effects. 3. In the following image you can see that even though the lighting setup is similar to the previous (mirrored), there's a lot more color on the model's body. 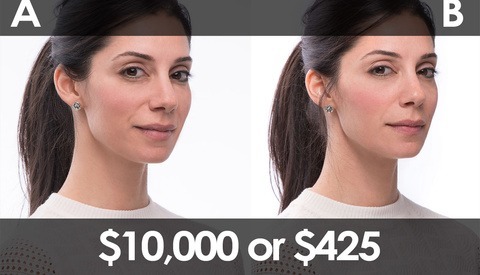 You can achieve this by moving the strobe with the colored light slightly closer to the camera plane allowing more light to spill on the model's face and body, and, of course, position the model accordingly. 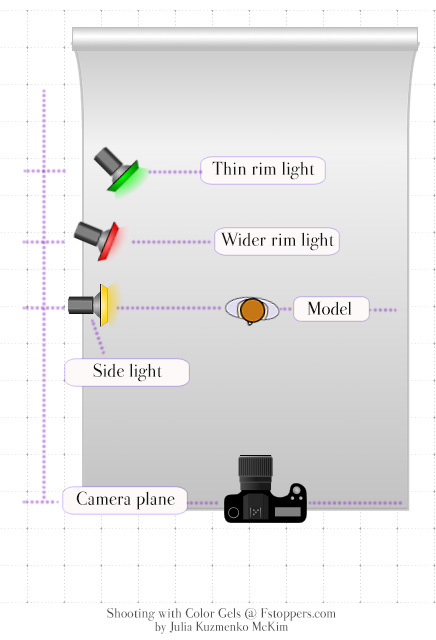 You can also control the width of the rim light by adjusting the position of the strobe, moving it along the camera-model-background axis (see illustration below). 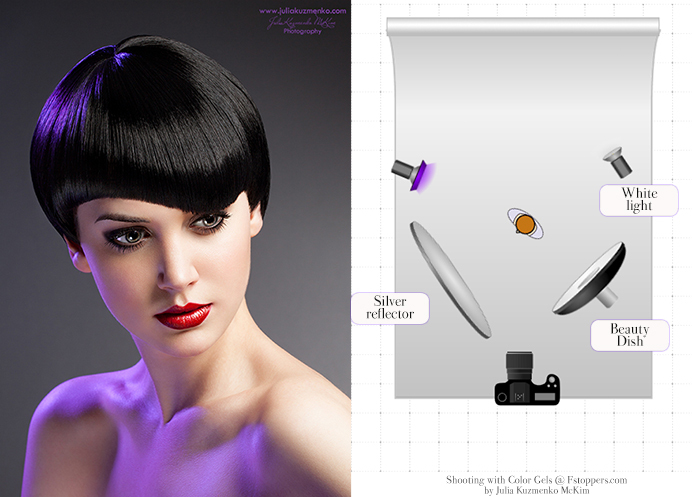 The closer the strobe to the plane of the model's position, the wider the rim light will be. And the further back from the model's plane along that same camera-model-background axis you place it, the thinner the rim light will be, i.e. less colored light visible to the camera will be spilling on the model's face. I know this may sound confusing, but once you try this in your studio, you will see how simple it actually is. Be careful to not move the strobe too close to the plane, in which the model is positioned, or the rim light will become side light, and side light can create messy shadows on the model's face and ruin the shot. But it, of course, depends on what you're trying to achieve in your photo. 4. 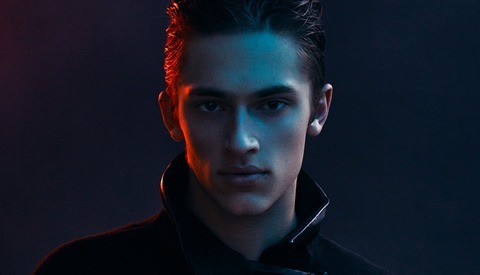 Two strobes with color gels, one on each side, subtle touch of color. When I want a very thin rim light on the model's cheek, I usually point the colored light approximately at the back of the model's head. 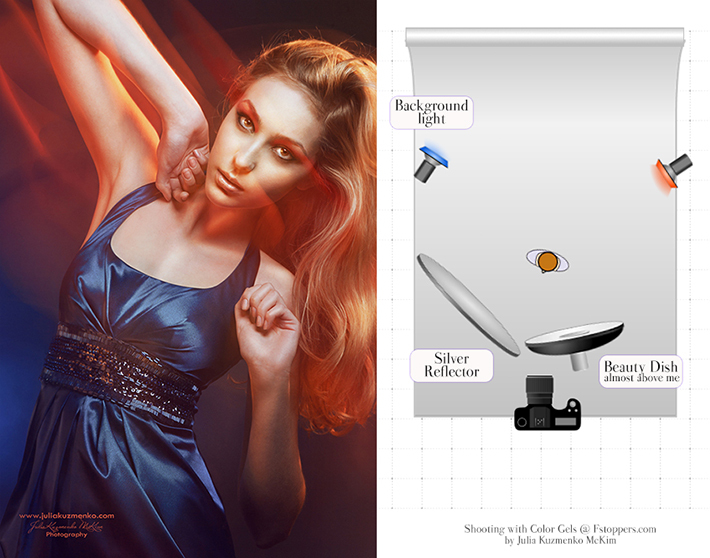 Basically, everything goes - you can mix strobes and flashes, and try various light modifiers. I normally combine complimentary colors, but it never hurts to experiment with unexpected pairs of colors. 2. Two strobes: hard blue light and soft red light. There's a simple metal reflector on the strobe (blue) and it's placed a little further away from the model, so that it creates hard light and a well-defined shadow on the wall. 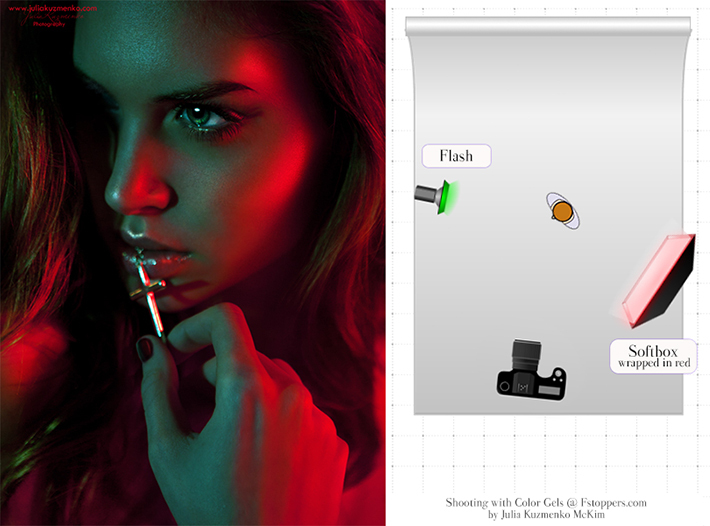 These are the setups I've played around with, and I'm sure you will come up with many more if you like the idea of experimenting with color gels. Come back and show us what you got! Use #FScolorgels hashtag when sharing your photos on Facebook, Twitter and Instagram. They are so much fun, right? I love color gels. They definitely allow for more options in the studio. I love using them with a 70-80%ish gray background paper. Really makes the color vibrant and fits into my style. Me too! I prefer gray backdrops too! Not only the colors pop against it, but you can add/remove light from it and basically go from white to black background with just one same backdrop. 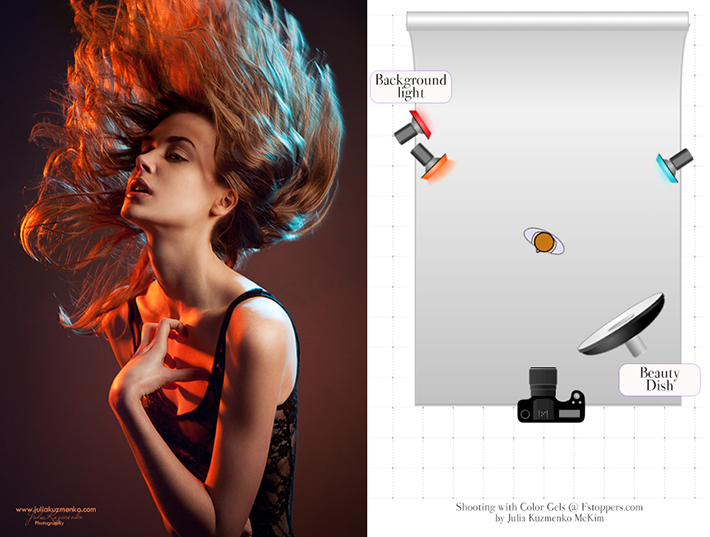 Which is especially nice when you often shoot in your studio - it really becomes boring using the same empty backgrounds. I actually have only a white background, and the color does not pop enough on it (it's nearly white at the end). What kind of gray background would you suggest for a start? A neutral gray (18%), or something darker, as Brook Clayton said? 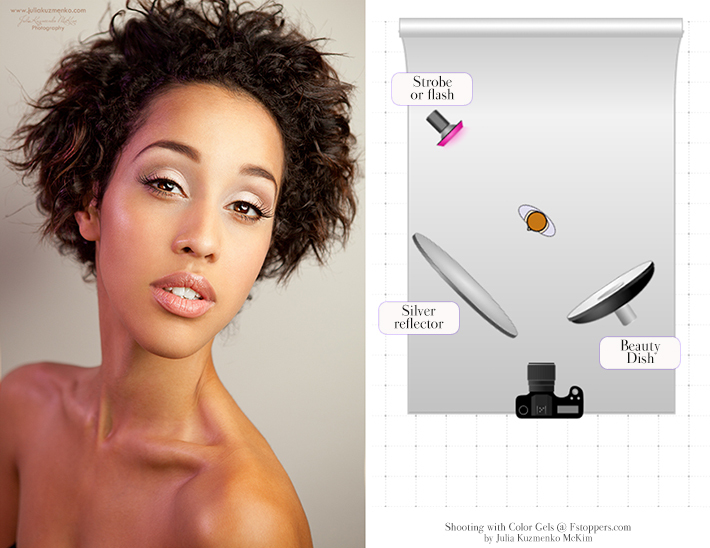 I always shoot with gray backdrops, or most of the time - you can throw more light on your backdrop and have white background, or move away from the backdrop and "cut" the light falling onto it and have black background in the pictures. And in order to have any rim light visible you have to have a darker background behind the model, otherwise rim light won't be visible whether it is with color gels or not. This was inspiring and very educational. i'm definetly buying your book hahahaha I'm such a fan of your work. Awesome post! Thanks for the informative post. It's great seeing a fashion photographer on the team. Looking forward to more posts from you. can you suggest some gels to buy for speedlights ? can you suggest me to buy some ? 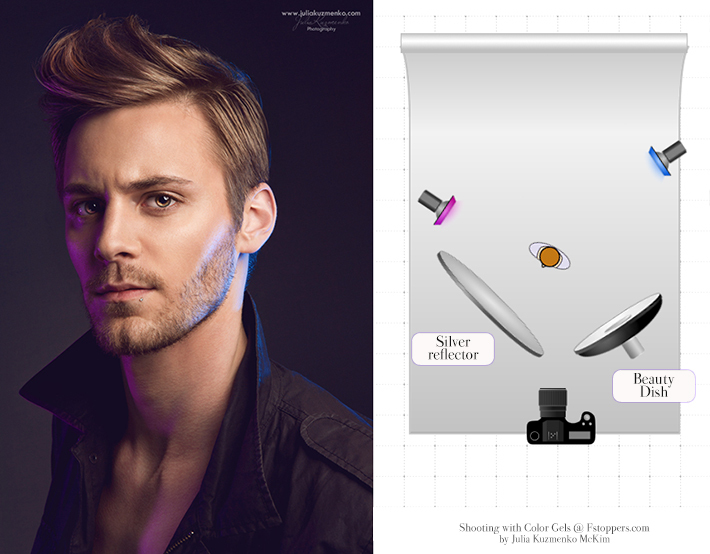 This is easily one of the most informative article regarding color gels i've seen in the net. It's short, but precise and in-depth explanation. Wow. Thank you Adi! It's my pleasure! Thanks a lot Julia for the great post!! I really enjoyed your book and was wondering how some of the lighting setups were done. You answered my wish. Happy to see you part of the FS team. Looking forward to more posts like this. Thank you for a great write-up and congrats on joining F-stoppers. It's been a monumental year for you so far, and it's far from over yet !